Since we did go to the Sparks concert last night let me try putting together thoughts about that. We learned about the concert at the last minute, through an app bunny_hugger has which says when bands she likes are playing nearby; she doesn't remember specifically adding Sparks, but found out about them a couple days ago and initially supposed she couldn't possibly, given the workload. By morning, she had resolved to go if she got all her backlog of work finished, and she did, so thanks, Sparks, for that motivation. The venue, the Crofoot Ballroom, is in Pontiac, a Detroit suburb notoriously depressed although really not looking too bad, from what we saw. We got there along a state highway that took us through quite a few charming towns with great neon signs, several of them clearly vacation or resort spots, with shops offering to seal your boat in plastic-wrap for the winter and the like. It's easy for us to drive to, and has an attractive balcony that apparently only VIPs can enter, and has, as many reviews promise, a sparkling-clean (men's) bathroom with those waterless urinals you see in malls trying to upscale themselves. The concert was just Sparks, no opening band. The disadvantage there was the show starting later than the 9 pm we expected, and not hearing some up-and-coming band that might have compatible sensibilities. The advantage is that they played rather more than they might have with an opening band. The crowd was an older one than we'd see at a Walk The Moon concert, so we didn't stand out as elders, and was pretty split between hipster-y folks, people who looked like they could have been on my left-wing student newspaper back when I was an undergraduate, and folks who looked like supporting cast on The Big Bang Theory . bunny_hugger exchanged several amusing texts with her brother, speculating about the attendees; he advised there was surely someone wearing a blazer under a hoodie, Brooklyn hipster uniform for years now. We didn't notice any, nor any women with 80's Aerosmith shirts cut up for baby doll-style shirts. At least one person walked past carrying several bottles of Pabst Blue Ribbon and one of Schlitz, a beer I honestly thought they had lost the recipe for. 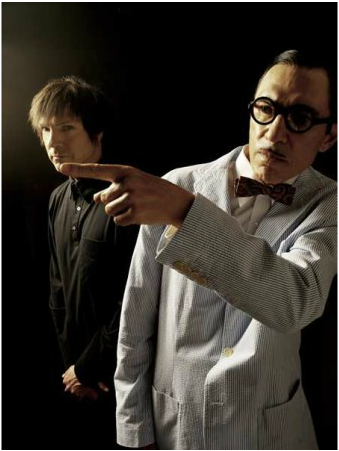 bunny_hugger had joked that she would call it a birthday present to her specifically if Sparks played any songs from the album Big Beat, from which two songs were selected for their inexplicable appearance in the movie Rollercoaster . She knew they wouldn't, because this tour --- ``The Revenge Of Two Hands, One Mouth'' --- was to be as close to acoustic as Sparks gets, with just keyboard (Ron Mael) and voice (Russell mael), no backup band, no session musicians. Big Beat just would be absurd on so little instrumentation. I noted that yes, if there's one thing Sparks wouldn't do it's make themselves sound weird. They played not just a song from Big Beat, but the song ``Big Boy'', about David and Goliath, one of the two songs actually featured in Rollercoaster and probably the better of them. surely it's the one more interesting to us as it's become the main theme of our Flemish giant. (His other theme is Walk The Moon's ``Jenny''.) About all they could've done more would be to invite bunny_hugger up on stage to sing ``Everybody's Stupid'' with them. They had the subwoofer turned up so that not just the floor, but our bodies and for that matter the Canadian shield were vibrating, apparently from a desire to give us the feeling we were playing underneath a roller coaster. They also brought out selected songs from The Seduction of Ingmar Bergman, an opera commissioned by Sweden's national radio broadcaster about Ingmar Bergman's (fictional) jaunt to Hollywood in the mid-50s. It's apparently inspired by the Mael brothers' troubles getting a film based on the manga Mai the Psychic Girl produced, flavored with some absurdity from their work with Jacques Tati on an incomplete film. They're apparently trying to get this turned into a movie. I ... have to trust that this isn't all an enormous put-on, but honestly don't know. They also came back for a three-song encore, one more generous than we expected, and that after the audience's applause and calls for more included foot-stomping, which is apparently out of the fashion for this sort of thing. After the performance they stood before the audience, affecting (I assume) the awkward self-consciousness that you'd get if you picked a couple people out of the audience and abandoned them mid-stage with no instructions and no clear idea where the exit was. But they also grinned --- Russell, manically, Ron, just barely --- in this way that exuded warmth. You could imagine easily the audience rushing them to give them hugs. That's the sort of stage presence they have: it looks almost accidental, until you really pay attention and notice how much craft has to go into it. Trivia: During his 1866-67 postdoctoral stint at the Pulkovo observatory near Saint Petersburg, Cleveland Abbe (a leader in the standardized time movement and later president of the American Metrological Society) instructed his mother to stop addressing letters to him in care of the ``National Observatory'' as the Russian people had no ``national'' concepts besides the language; everything was the Tsar's or his donation. Source:	 Time Lord: Sir Stanford Fleming And The Creation of Standard Time, Clark Blaise. Currently Reading:	 The Outdoor Amusement Industry, William F Mangels.